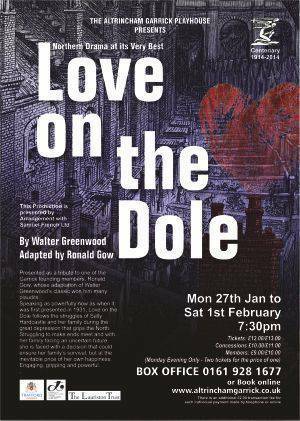 ‘LOVE ON THE DOLE’, presented, in our Centenary year, as a tribute to one of the Garrick founding members, Ronald Gow, whose adaptation of Walter Greenwood?s classic won him many plaudits. Ronald Gow, playwright: born Heaton Moor, Lancashire 1 November 1897; married 1937 Wendy Hiller (one son, one daughter); died 27 April 1993. ALTHOUGH our rep theatres still do valuable work (and heaven forbid that any of it should be underrated, since they are the key to any serious future stage drama in Britain may have), they were more exciting places in Annie Horniman’s day. In the 1910s a young Mancunian playgoer like Ronald Gow could taste at first hand the art of playwrights like Harold Brighouse, Allan Monkhouse and Stanley Houghton, founders of what later became known as the Manchester School – and of actors like Sybil Thorndike and Lewis Casson. Stage-struck not only as a spectator, but as a theatrical practitioner, Gow revered their headquarters, the Gaiety Theatre, just off Albert Square. With Horniman and her tea fortune behind it, and with the Manchester Guardian’s eloquent critical support through writers like CE Montague, Allan Monkhouse, James Agate et al, it earned itself a national reputation for socially enlightened drama of the kind that did not come round again for another 40 years, when the Royal Court set up shop under George Devine in 1956. During his upbringing near Manchester, Gow’s family got to know several of those Manchester School dramatists who were always harping on some social injustice or other in plays like Hindle Wakes (Stanley Houghton), Hobson’s Choice (Harold Brighouse) and Jane Clegg (St John Ervine). Gow was proud of having acted once on the same stage as Houghton. No wonder then if, as a university graduate and a keen amateur actor, he had a go at writing plays himself, one- acters to start with, some of which were put on during the 1920s by his local amateur group, the Altrincham Garrick; and in the 1930s two of his full-length pieces even reached London. One of them took a thoroughly wholesome anti-war and anti-romantic view of the doings of Bonnie Prince Charlie. It lasted for six weeks at Swiss Cottage. Another, Gallows Glorious, evoking John Brown of the soul which went marching on, waxed indignant about slavery. It survived only two weeks in the West End and two nights in New York. But it was a start. All Gow needed was a more urgent theme. He himself had never been a victim of the Depression or an ‘angry young man’, but when the unemployment figures reached 3 million he knew he had his subject. He chanced to read a popular novel, Love on the Dole, which dwelt movingly though fictitiously on the plight of a young Salford woman trying to make ends meet as the only member of her family with a job. Gow promptly dropped his own ideas and dramatised Walter Greenwood’s novel. He sent the script to the Gaiety, which he had always considered ‘the greatest thing that ever happened’ to Manchester, and waited. By chance one of that theatre’s equally stage-struck young actresses had just been sacked. Everybody (except her) supposed it to have been the best thing that could happen to her. From leaving school Wendy Hiller had loved the place and been proud to fulfil the humblest tasks for the Manchester Repertory Theatre. Making tea, washing up, sweeping the stage, acting small parts, prompting, understudying – it didn’t matter as long as she could just be there. Suddenly, though, she couldn’t. She was not considered good enough. So after four devoted years they fired her. She went home to Bramhall, Cheshire, and moped. Meanwhile Gow’s script turned up, irresistibly, at the Gaiety. But its young heroine would require a Lancashire accent; and wasn’t the girl they had just fired rather good at Lancashire accents? Miss Hiller was sent for. If ever one play made the reputation of both the playwright and his leading lady it was Love on the Dole; and though Gow always insisted that it was also Greenwood’s work, it brought him promptly to the attention of the film studios and Wendy Hiller (whom Gow married in 1937), and to Bernard Shaw’s attention in the casting of Saint Joan and Eliza Doolittle at the Malvern festival of 1936 – and in the film of Pygmalion. Was the play sentimental? Was it a true tragi-comedy? It would be nice to know, but how can we without a first- rate National Theatre production? Olivier was the last theatre manager to show much feeling for the Manchester School; and though Gow’s drama, or rather Gow and Greenwood’s drama, of a young woman who to keep her family from the breadline accepts a married bookmaker’s proposition to provide for her and her family if she becomes his nominal housekeeper, sounds a bit tearful for a modern audience, might it not work as a period piece if well presented? Not that it was Gow’s only successful adaptation, or the only vehicle he wrote for Wendy Hiller. As Tess in his version of Hardy’s Tess of the D’Urbervilles (1946) she was unforgettably moving. As HG Wells’s Ann Veronica three years later she won more golden opinions. And in such West End productions as The Edwardians (1960), from Vita Sackville- West’s novel, and A Boston Story (1968), from a Henry James story, Gow again showed his skill as adaptor. In fact the only really popular play he wrote entirely off his own bat seems to have been Ma’s Bit o’ Brass (1938), a regular stand-by of the northern reps.